Canker sores are the most common type of oral lesion, affecting about 20% of people. Women get canker sores more often than men. Canker sore susceptibility may be inherited, and the condition can run in families. What Causes Canker Sores (Aphthous Ulcer)? The exact cause of most canker sores is unknown. Stress or tissue injury is thought to be the cause of simple canker sores. Certain foods -- including citrus or acidic fruits and vegetables (such as lemons, oranges, pineapples, apples, figs, tomatoes, and strawberries) -- can trigger a canker sore or make the problem worse. Sometimes a sharp tooth surface or dental appliance, such as braces or ill-fitting dentures, might also trigger canker sores. Some cases of complex canker sores are caused by an underlying health condition, such as an impaired immune system; nutritional problems, such as vitamin B-12, zinc, folic acid, or iron deficiency; and gastrointestinal tract disease, such as Celiac disease and Crohn's disease. Are cold sores the same thing as Canker Sores (Aphthous Ulcer)? No. Although these sores are often confused for each other, they are not the same. Cold sores, also called fever blisters or herpes simplex type 1, are groups of painful, fluid-filled blisters. Unlike canker sores, cold sores are caused by a virus and are extremely contagious. Also, cold sores typically appear outside the mouth -- usually, under the nose, around the lips, or under the chin, while canker sores occur inside the mouth. What are symptoms of Canker Sores (Aphthous Ulcer)? How are Canker Sores (Aphthous Ulcer) treated? If you have several canker sores, your doctor may prescribe a mouth rinse containing the steroid dexamethasone (dek-suh-METH-uh-sown) to reduce pain and inflammation. Oral suspensions of the antibiotic tetracycline also can reduce pain and cut healing time, but tetracycline has drawbacks. It can make you more susceptible to oral thrush, a fungal infection that causes painful mouth sores, and it can permanently discolor children's teeth. Over-the-counter and prescription pastes with active ingredients such as benzocaine (Anbesol), amlexanox (Aphthasol) and fluocinonide (Lidex, Vanos) can help relieve pain and speed healing if applied to individual sores as soon as they appear. Your doctor may recommend applying the paste to the sore two to four times a day until it heals. Medications not intended specifically for canker sore treatment, such as the heartburn drug cimetidine (Tagamet) and colchicine, which is normally used to treat gout, may be helpful for canker sores. Your doctor may prescribe oral steroid medications when severe canker sores don't respond to other treatments, but because of serious side effects, they're usually considered a last resort. During cautery, an instrument or chemical substance is used to burn, sear or destroy tissue. Debacterol is a topical solution designed to treat canker sores and gum problems. 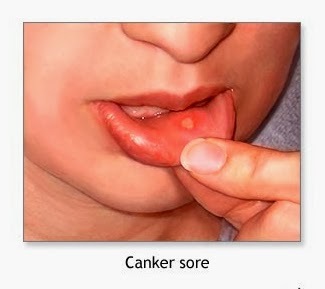 By chemically cauterizing canker sores, this medication may reduce healing time to about a week. Silver nitrate — another option for chemical cautery of canker sores — hasn't been shown to speed healing, but it may help relieve canker sore pain. Your doctor may prescribe a nutritional supplement if you consume low amounts of important nutrients, such as folate (folic acid), vitamin B-6, vitamin B-12 or zinc. Can mouthwash solutions be used to treat Canker Sores (Aphthous Ulcer)? There are several mouthwash solutions that may be used to treat canker sore symptoms. Diphenhydramine suspension (Benadryl Allergy liquid) is available over-the-counter and can be used as a mouth rinse because it has topical anesthetic effects on the tissue of the mouth and the canker sore. Put the suspension in your mouth, swish it around for 30 seconds to one minute, and spit it out. Do not swallow the rinse. Anti-inflammatory steroid mouth rinses may be prescribed by your doctor or dentist to help reduce inflammation. Tetracycline antibiotic rinses may be prescribed, and have been shown to relieve the pain and promote healing of canker sores. Tetracycline should not be used by pregnant women, people allergic to tetracycline, or children under 16. Can Canker Sores (Aphthous Ulcer) Be Prevented? Avoiding foods that irritate your mouth, including citrus fruits and acidic vegetables and spicy foods. Avoiding irritation from gum chewing. Try over-the-counter products that contain the numbing agent benzocaine.